HETAUDA, July 5: Farmers of northern part of Makawanpur districts are suffering huge loss as fresh vegetables produced by them is not finding buyers. Vegetable production has increased in northern parts of the district with the arrival of monsoon rains. The farmers, however, are not finding market for their products even in district headquarters Hetauda. Khadga Bahadur Moktan, the president of Makawanpur chapter of Nepal Fruit and Vegetable Traders Association, told Republica that the market in Hetauda cannot consume all the vegetables produced in the district. Around 50 tons of vegetables produced in different parts of the district come to Hetauda on a daily basis. “Nearly 20 tons of vegetables worth about Rs 50,000 go to waste every day as the city is too small to consume such a large quantity of vegetables,” said Moktan. According to local traders, vegetables consumption in Hetadua as well as export to nearby markets has fallen for the past couple of weeks. Large quantities of cabbage and radish have been dumped in recent days, they say. The association has been paying Rs 15,000 to Hetauda Sub-Metropolitan City every month to dump rotten vegetables. 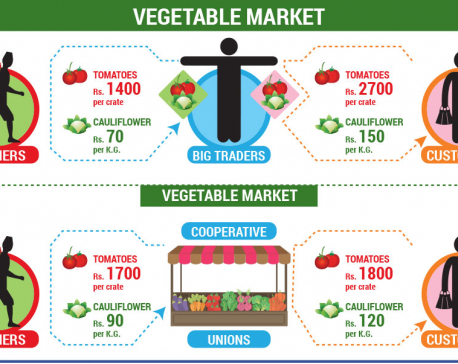 Data compiled by the association shows that Hetauda consumes 10 tons of vegetables every day, while the city exports nearly 20 tons to markets in other districts. Mahananda Sapkota, president of Makawanpur Chapter of Federation of National Association of Farmers' Groups, said farmers were suffering huge loss as they have not been able to supply vegetables to Kathmandu due to disruption of vehicular traffic along Narayanghat-Mugling road. “As a result, vegetable produced in Chitwan is also coming to Hetauda. Over supply of vegetables is causing farmers huge loss,” he said. According to farmers, over supply of vegetables has also caused vegetable prices to fall much to the dismay of farmers. Vegetables like cabbage, coriander, cauliflower, radish, and chili, among others, produced in the district are exported to other districts like Bara, Rautahat, Sarlahi, Kaski, Butwal and Sunsari, among others. Thaha Municipality as well as Dadabas, Sisneri, Markhu, Bhimphedi, Daman, Namtar, Palung and other northern villages are the major vegetables producers in Makawanpur district.